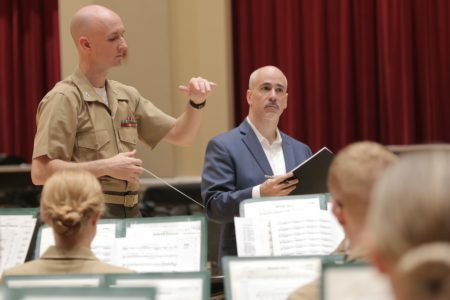 Boyer’s second concert band work, Fanfare, Hymn and Finale, was commissioned by “The President’s Own” United States Marine Band in celebration of its 220th anniversary season in 2018. Composing this work for one of the most renowned wind bands in the world (formerly directed by John Philip Sousa) was a special honor for Boyer, who followed in the footsteps of John Williams, composer of the Marine Band’s 215th anniversary work in 2013. Fanfare, Hymn and Finale was premiered by the Marine Band at the Texas Bandmasters Association National Convention in July 2018. 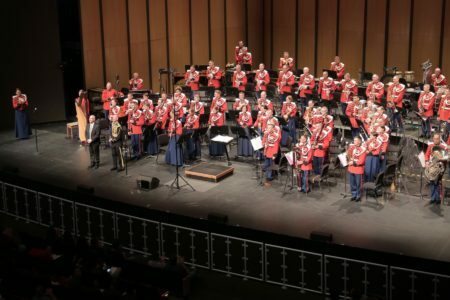 When I received an invitation from Colonel Jason K. Fettig to compose a work for “The President’s Own” United States Marine Band in celebration of its 220th anniversary, all at once I felt both deeply honored and struck with a certain sense of trepidation. 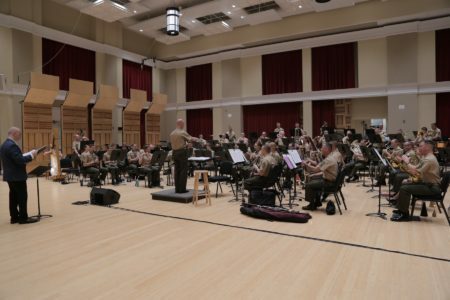 I knew immediately that I would have to undertake the rare opportunity and privilege which this commission represented; but as my compositional work has been primarily for orchestra, with only a single previous attempt at writing for concert band/wind ensemble, I realized that composing music worthy of this most renowned and historic ensemble would be quite a challenging endeavor. As I contemplated the nature of the music I might compose for the Marine Band, and the milestone represented by its 220th anniversary, I felt that the new piece simply had to open with a celebratory fanfare. 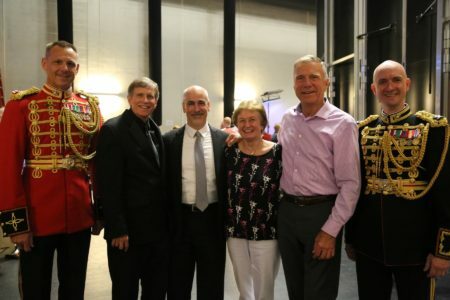 I also wanted to include contrasting music which might convey a sense of nobility, and provide the musicians an opportunity for lyrical playing, and thought that composing a hymn-like section could work well for this purpose. 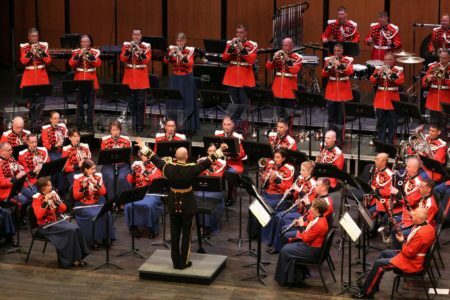 Finally, I thought that mixed-meter music of a jubilant, propulsive quality also would be appropriate for the occasion. 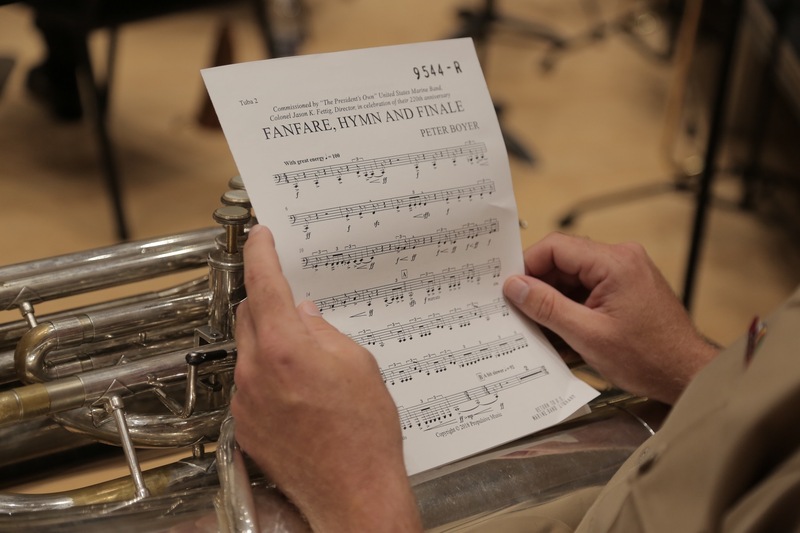 These varied thoughts led me to the title of Fanfare, Hymn and Finale, which I believe clearly describes the musical content and structure of the work. 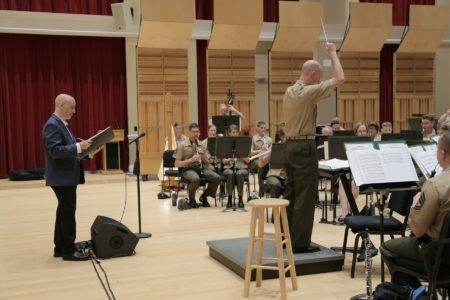 It is my hope that each of these three sections of this short work may convey something of an “American quality” appropriate for this esteemed, virtuoso ensemble. 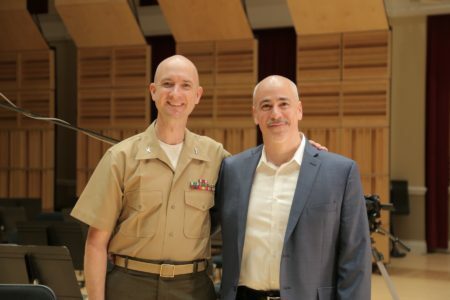 I would like to thank Col. Fettig for the unexpected honor of this commission, and all the members of “The President’s Own” United States Marine Band, both for bringing this new piece to life, and for sharing their great talents with us all. 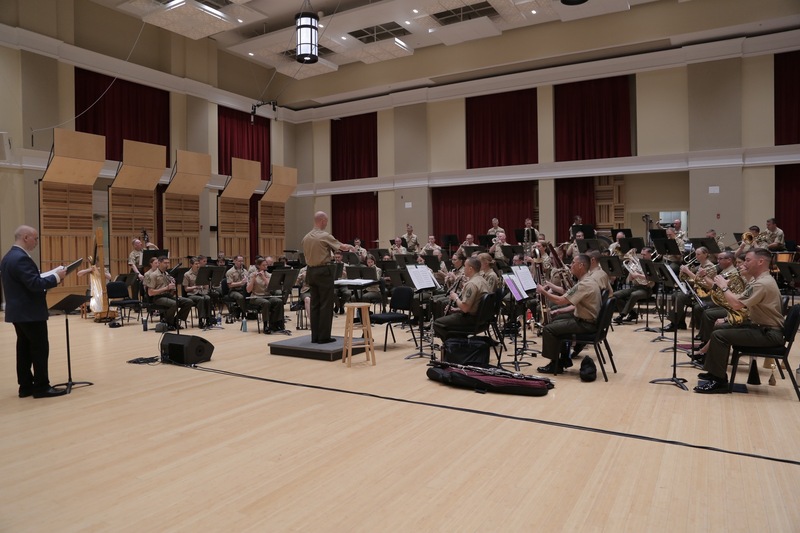 Rehearsals at the U.S. Marine Band’s Sousa Hall in Washington D.C., and premiere performance at the Lila Cockrell Theatre in San Antonio, July 2018. 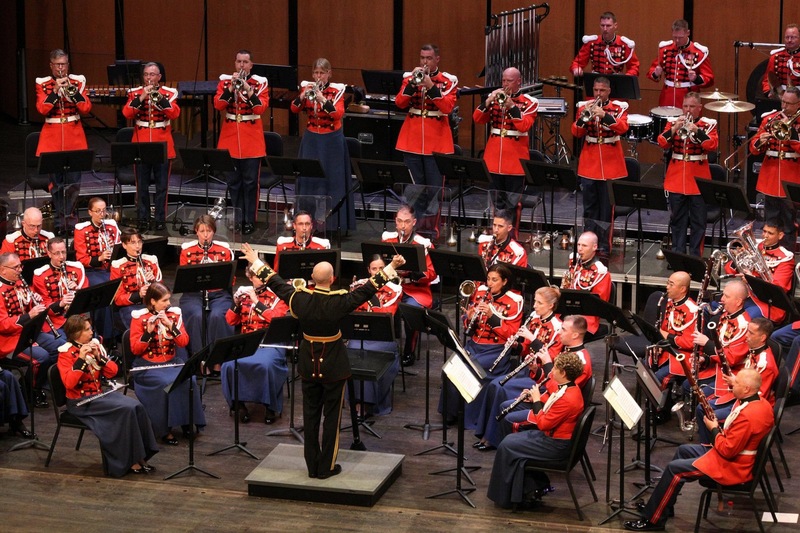 Photos by GySgt Rachel Ghadiali, courtesy of the U.S. Marine Band.